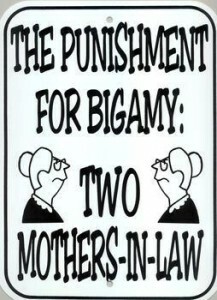 Jokes aside, bigamy is a serious matter , legally. So if you are affected ( or considering ;- ) ) it will be helpful for you to read on ! There is NO bar in customary Hindu Law to a man entering second marriage. However, the customary law was codified by the enactment of the Hindu Marriage Act in 1956, which declared a second marriage ‘void ‘during the subsistence of the first one. So, AFTER 1956, second marriages could be considered illegal. Bigamy is both an offence against Marriage ( Per HMA ) as well as a Penal Offense ( under IPC ). The Hindu Marriage Act applies to Hindus, Jains, Buddhists ,Sikhs,Parsis and Christians [except Muslims]. Bigamy is one of the ground to seek divorce under Hindu Marriage Act 1955.The second wife is entitlement for maintenance ,she is not entitle for property rights. In August 2009, the Law Commission of India recommended that bigamy should be made a cognizable offense. Any marriage between two Hindus solemnized after the commencement of this Act is void if at the date of such marriage either party had a husband or wife living; and the provisions of sections 494 and 495 of the Indian Penal Code (45 of 1860), shall apply accordingly. Note that the marriage is VOID- that is, illegal from the outset itself. It is not VOIDABLE – which requires a party to go through the legal procedure ending with a Decree by the Court declaring the marriage void. This has serious implications for ay one caught up in a Void marriage. Indian Penal code 1860, Section 494. Marrying again during lifetime of husband or wife: Whoever, having a husband or wife living, marries in any case in which such marriage is void by reason of its taking place during the life of such husband or wife, shall be punished with imprisonment of either description for a term which may extend to seven years, and shall also be liable to fine. Exception-This section does not extend to any person whose marriage with such husband or wife has been declare void by a Court of competent jurisdiction ,nor to any person who contracts a marriage during the life of a former husband or wife, if such husband or wife, at the time of the subsequent marriage, shall have been continually absent from such person for the space of seven years, and shall not have been heard of by such person as being alive within that time provided the person contracting such subsequent marriage shall, before such marriage takes place, inform the person with whom such marriage is contracted of the real state of facts so far as the same are within his or her knowledge. HOWEVER,. this of offense is attracted only when the second procedure was conducted legally so as to give it a legally accepted marriage status. If not, there is no second marriage to begin with and so no second wife and so, no bigamy. – by reason of its taking place during the life of husband or wife. When is Bigamy offense ? Section 5 of the Hindu Marriage Act, 1955, clearly states that a marriage could be valid only if neither of the party has a living spouse at the time of marriage. Section 11 of the Act declares second marriage to be null and void. the first spouse has been absent or not heard of continually for a space of seven years. Here The party marrying must inform the person with whom he or she marries of this fact. NOT allowed. In Sarla Mudgal v. Union of India (1995 AIR 1531 SC), the Supreme Court held that a man who has adopted Islam and renounced Hindu religion, marries again without taking divorce from the first wife, then such marriage is not legal. The person shall be punished for committing bigamy under section 494 of Indian Penal Code (IPC). Where to file complaint under Bigamy law-section 494? The person aggrieved ( which is the Legally Wed person – the first “husband” or “wife” ) can file a case of bigamy either in court or at the police station. The father of an aggrieved wife can also make a complaint under section 494/495 of the Indian Penal Code. A petition for declaring the second marriage as void can be filed by the parties of second marriage and NOT the first spouse. NONE ! The Supreme Court has held that while lodging a criminal complaint it is not necessary for the aggrieved party to prove that marriage ceremonies were performed as it is for the trial court to decide the veracity of the allegations. “Truthfulness or otherwise of the allegation is not fit to be gone into at this stage as it is always a matter of trial. Essential ceremonies of the marriage were gone into or not is a matter of trial,” a bench of Justices D K Jain and C K Prasad said in a judgement. The apex court gave the verdict while upholding the appeal of a woman K Neelavani, challenging a Madras High Court order quashing the charge sheet filed against her husband S K Siva Kumar under IPC Sections 406 (breach of trust) and 494 (bigamy-second marriage). To maintain the charge under section 494 IPC, there should be evidence to show that essential ceremonies were performed at the time of alleged second marriage and such ceremonies and other requirements for a valid marriage have to be established by adducing evidence in the course of trial and a valid marriage between a man and woman cannot be presumed from the fact that a child was born out of their relationship. What if the person hides the first marriage and contracts another one ? What is Punishment under the Act? Bigamy is a NON-cognizable offense. It is bailable and compoundable with the permission of court if the offense is committed under section 494 of the IPC. Punishment is imprisonment, which may extend till 7 years or fine or both. In case the person charged of bigamy has performed the second marriage by hiding the fact of first marriage, then he shall be punished with imprisonment of up to 10 years or fine or both. Such offense under section 495 is not compoundable. Attending 2nd marriage is abetting bigamy? “It is a settled law that mere participation in the second marriage would not ipso-facto make the relatives or the participants liable for abetment to bigamy since abetment connotes an active suggestion or support to the commission of the crime.” ruled Delhi High Court. This penal provision will not apply if the offender is a member of the Schedule Tribes. What about Property matters ? As per Hindu code, only the first wife is a legal heir of the husband while the second wife is NOT entitled to any share in the ancestral estate and, if the husband has died without leaving a will, even in his self-acquired property. Once the second marriage is declared null and void, the wife concerned cannot even claim maintenance as a matter of right. BUT, The high court of Bombay at Goa has held that the first wife is entitled to half the share while the share of the second wife in the property of the husband is 1/8th, while ruling that a second wife marrying in good faith has a share in the estate of her husband. The court ruled that in such cases the first wife gets half the share, the second wife is entitled to 1/8th of the share and the remaining 3/8th is to be shared among the children from both marriages. Can children born out of wedlock inherit father ancestral property? The Supreme Court has ruled that children born out of wedlock have the right to inherit their father’s ancestral property.In Revanasiddappa vs Mallikarjun case , Justices G.S. Singhvi and A.K. Ganguly ruled that children from a second wife had rights to their father’s ancestral property. Status of Live In Relationships…? The supreme court of India in Kushboo case virtually equated Live –in relationship to marital relationship. In another case ,the supreme court also said Children born out of live-in are not illegitimate. “The live-in- relationship if continued for such a long time, cannot be termed in as “walk in and walk out” relationship and there is a presumption of marriage between them ..”Supreme Court in 2004 in the Rameshchandra Daga vs Rameshwari Daga case ,where the maintenance rights of women in “informal relationships or invalid marriages” were upheld.These cases virtually encourage relationship outside-marriage,this created confusion in the minds of people. The law of bigamy is NOT applicable to live- in relationship as there is no legally contacted marriage. In order to prove offence of bigamy ,there should ample evidence to prove they have contacted second marriage without nullifying the first marriage. Is S. 498 A of IPC 1860 applicable to the Second Wife ? The section 498 A of IPC is not applicable to second wife since the second Wife is NOT a ” wife” in the eyes of Law.